Today we have a range of items of interest for you. Again we continue through the alphabet of archaeology across our region with C and D, E and F with a mix of Cresswell, Dogs, Egypt and Excavations, notice of a Forum and also of Fieldwork reported. We also look ahead to the Festival of Archaeology as well. No less important we also remind you below of three other letters – A, G and M. Our AGM is on Saturday 20 May in Newcastle this year. Committee have noted the discussions from our recent Conference/Workshop and this gives us a chance to discuss in more detail our work – past, present and future – for you and your group. Our AGM is on Saturday 20 May 2017. If you haven’t booked up, or let us know of your apologies and instructions, please do so as soon as possible. This is your chance to hear of the work that Committee have been involved with on your behalf at local, regional and national meetings, as well as your chance to help in our aims and direction for the future. If you wish to raise anything please do so by the end of this week. We are especially keen that our group members to send representatives along. We had various comments for a ‘resource bank’ at our conference/workshop in April, as well as more generally, and will look to discuss this and CBA North’s role into the future at this meeting. The meeting is not all business however. The day gives you the chance to network and update other members of news, as well as hear a talk on the Portable Antiquities Scheme – in its 20th anniversary year – as well as participate in special tours of the Great North Museum: Hancock. If you have had problems printing or returning the booking form sent through the emails, please let us know (including for any apologies and instructions in your absence) by emailing us at cbanorth@archaeologyuk.org. The booking form is available on our website home page as a .pdf and also as a .doc file if you find it easier to use those versions. The deadline for any business from the floor to be considered is Saturday. 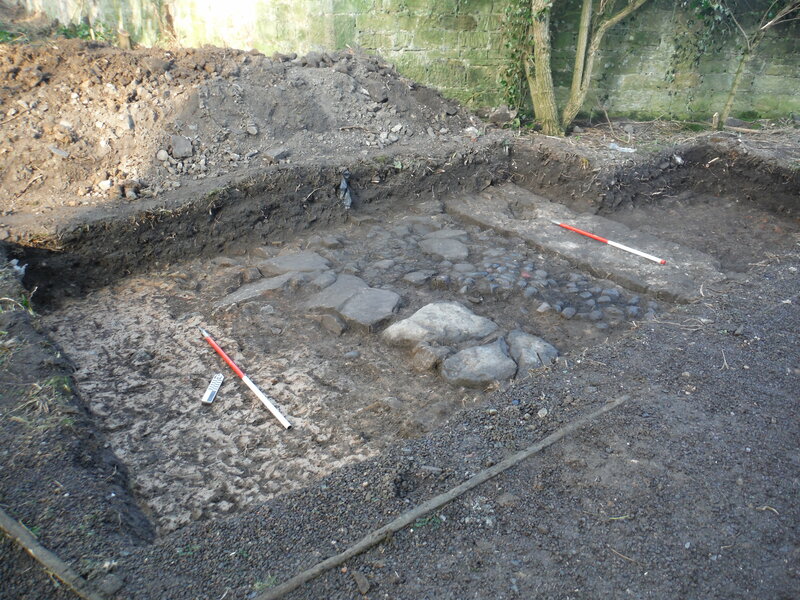 Philippa Hunter, formerly Cockburn, of Archaeological Research Services has sent us this update of work whose open-day we publicised earlier this year. “The Cresswell Pele Tower Project is led by Cresswell Parish Council and the Greater Morpeth Development Trust. The aim of this Heritage Lottery Funded project is to remove the tower (see below) from the Historic England Heritage at Risk Register and to provide public access to the tower. This aim will be met while also providing volunteer opportunities and public engagement activities. The programme of archaeological work includes geophysical survey, fieldwalking, archaeological evaluation trenching, building survey, watching brief and archival research. The pele tower with excavations, and excavators, in the foreground. Cresswell Pele Tower represents a well-preserved example of a border tower house or ‘pele’ and is believed to date to the 14th or 15th century. In the 18th century a large mansion house was constructed adjoining the tower, but was later demolished. The tower now stands on the edge of a caravan park where it has been the target of vandals in recent years. A two-week archaeological evaluation followed geophysical survey and fieldwalking in February 2017. The evaluation was conducted within Fisheries Field, to the east and south of the pele tower, and in the immediate vicinity of the pele tower itself. The evaluation aimed to identify and assess any archaeological features within these areas. A total of nine evaluation trenches were excavated within Fisheries Field and revealed evidence of Mesolithic flint knapping activity, Bronze Age burials and medieval ploughing. A further three, hand-dug trenches were opened up around the tower. These trenches produced important new evidence for buried archaeological remains including an earlier building than the tower consisting of a cobbled floor surface and a rough but substantial wall foundation (see above). 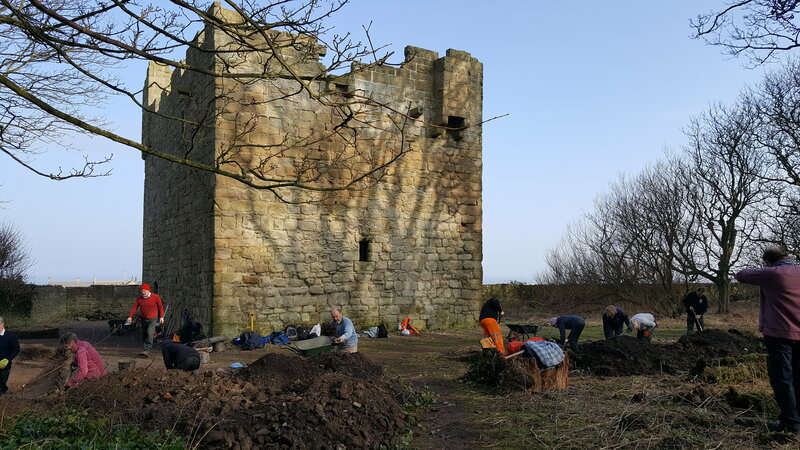 Medieval pottery dating from the 12th -14th centuries was also recovered supporting the structural evidence for occupation on the site pre-dating the pele tower”. Full reports of the work carried out, so far, can be found on the project’s website pages here. These reports include further details of the varied fieldwork, locations around Cresswell and also of the many of the finds recovered. Further work is planned, as well as a talk on Wednesday 26 July at Cresswell Village Hall by Barry Mead as part of the Festival of Archaeology events across the north and indeed across the country. Our further letters of the alphabet come from the North East Ancient Egypt Society’s meeting. The cats of Ancient Egypt are well-known generally, but this talk deals with the dogs. Other events this weekend also include the AGM of our group member the Architectural and Archaeological Society of Durham and Northumberland at Shildon, near Darlington, the Tyne and Wear Heritage Forum’s second conference at Wallsend Memorial Hall (places are still available from here) for our F which includes details of the CITiZAN project whose fieldwork we covered last year (pictured below), as well as CBA National’s Member’s Weekend which is based on Tyneside this year. We’ll have more on Festival of Archaeology events in further emails to you. We are particularly keen to promote the work of groups across our region, especially to those unable to make our April event. Please feel free to let us know of your future events. 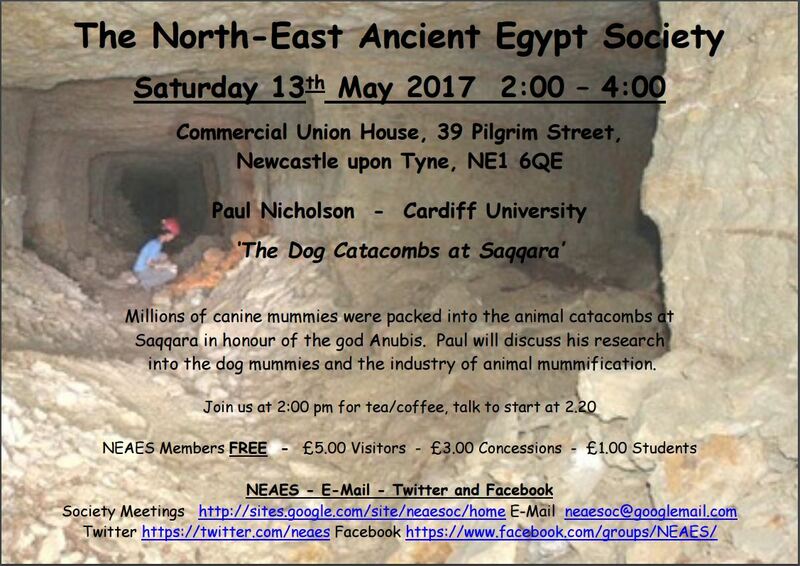 This entry was posted in E Newsletter and tagged AASDN, AGM, Ancient Egypt, Animals, CBA North, conference, Cresswell, excavation, fieldwork, NEAES, TWHF on May 12, 2017 by cbanorth. Hard on the heels of our Conference/Workshop ‘Summarising and Sustaining’ yesterday, we have notice of our own AGM below. Our thanks to all the speakers and audience at yesterday’s event, as well as to our hosts the Department of Archaeology, Newcastle University, for the day. We hope everyone enjoyed the day. It has given us plenty to think on for the AGM and we would like to continue on the afternoon’s discussions on to take forward the many thoughts and comments made. Some comments have already been made to our Twitter account @CBANorth and we welcome further ones from those there and, unfortunately, unable to attend. It is again hoped that as many of our members and group members can attend these events as possible – we are the regional group for archaeological groups and individuals. Though across the North and with many interests, groups and sectors across the archaeological and historical world and ourselves, we are all interested in the past. Again details, and the booking forms, can be found on our website in the page AGM 2017. I am writing to give you the formal notice of our Annual General Meeting which will be from 10.30am on Saturday 20 May 2017. This will be in the Council Room of the Great North Museum: Hancock, Barras Bridge, Newcastle upon Tyne, NE2 4PT (see https://greatnorthmuseum.org.uk/ for more). We will have notices to indicate the way. Business will begin promptly at 10.30am. The agenda is given below. A summary of the 2016 AGM will be available on our website soon and an email sent out drawing your attention to this new addition once online. Please print out the booking form below (also available on our website) to confirm your attendance, or send apologies in, for this meeting. Currently there are vacancies and gaps in the coverage of issues by Committee due to changes in position, location and work of current members. Some gaps are long-standing, others newer. If you are interested in covering the academic or commercial sectors, maritime/nautical archaeology, museums, and making links to the Young Archaeologists Clubs and other youth groups for us, we would urge you to get involved or nominate people that committee can approach to co-opt this year. Nevertheless CBA North Committee, as at any other time, welcome thoughts on what you think CBA North should be doing during 2017. If you would like to raise an issue at the AGM please let us know at least seven days before the meeting. Our AGM takes a different form this year. Previously we invited local archaeological groups to report upon their past and planned activities (though only a few took up this offer). As the AGM is hot on the heels of our Conference/Workshop, we will discussing that day and how we can take things forward from that. 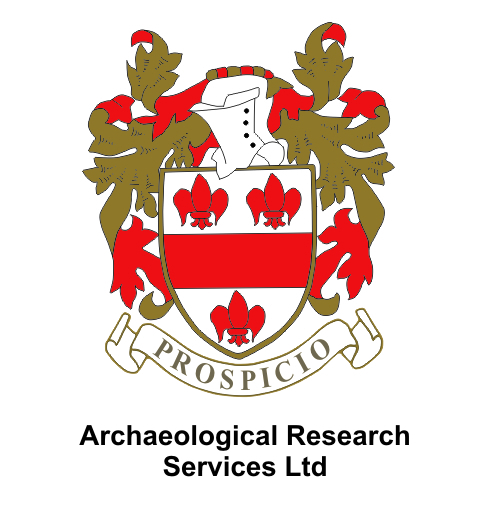 The morning business will be followed by a talk from Andrew Agate and Ben Westwood, recently appointed Finds Liaison Officers covering the eastern side of our region, who will deal with their Portable Antiquities Scheme-based work. We will then break for lunch before reconvening at 2.00pm for tours of our venue. These will be led by Andrew Parkin, a curator at the museum, for a behind the scenes tour of the museum, and Howard Cleeve, Hon. Assistant Librarian, The Society of Antiquaries of Newcastle upon Tyne, who will give an introduction to the Society’s collection in the library. I would be most grateful if you could let me know whether you will be attending the meeting. Please print, complete both parts and return the booking form so it reaches me by Saturday 13 May 2017 at the very latest. Please return this booking form by 13 May 2017! I/we will not be attending the CBA North AGM on 20 May 2017 and wish to nominate the Chair as my proxy. I/we will not be attending the CBA North AGM on 20 May 2017 and do not wish to nominate a proxy. I/we would like to attend the behind the scenes tour of the GNM: Hancock on the afternoon of 20 May 2017 ……………………………………………………………………………………………………………………..
I/we would like to attend the tour of The Society of Antiquaries of Newcastle upon Tyne’s library on the afternoon of 20 May 2017 ………………………………………………………………………………. We have the booking form available on the website page as a .pdf here CBA North Booking Form, 20.05.2017 and also as a .doc file CBA North Booking Form, 20.05.2017 if you find it easier to use those versions to reply. This entry was posted in E Newsletter and tagged AGM, CBA North, Finds, Finds Liaison Officers, Great North Museum, Newcastle, PAS, SANT on April 30, 2017 by cbanorth. I am writing to invite you to attend the Annual General Meeting of the Council of British Archaeology North region which will be from 10.00am on Saturday 25 April 2015 at the Literary and Philosophical Society, 23 Westgate Road, Newcastle upon Tyne, NE1 1SE. Details of the venue can be found at http://www.litandphil.org.uk/visit.shtml. The business part of the meeting will begin promptly at 10.30am where the agenda below will be dealt with. We extend our invitation to everyone with an interest in the history and archaeology of the area covered by CBA North, even though you may not be a member of CBA North or National CBA. We would welcome any of your thoughts at this meeting though for clarification you would not be able to vote for any of the matters of the AGM business of CBA North. This year we have invited some local archaeological societies to report upon their work during 2014 to everyone else in an informal manner. We will be hearing from the Border Archaeological Society (BAS) and Coquetdale Community Archaeology (CCA) who have carried out a range of activities in Northumberland, before a tour of the ‘Lit and Phil’s’ extensive and diverse library. If there are sufficient numbers we may well reconvene for further possible events in the afternoon. I would be most grateful if you could let me know whether you will be attending the meeting by filing in the attached booking form and returning it to our new address above, or by emailing me at cbanorth@archaeologyuk.org by Saturday 18 April as we need to know numbers for refreshments and the tour of the library, as well as for anything further in the afternoon. Please feel free to circulate this notice. I will be attending the CBA North AGM on 25 April 2015 (if for a group please say which)…………………………………………………………………………….. This entry was posted in E Newsletter and tagged AGM, CBA, CBA North on April 13, 2015 by cbanorth.